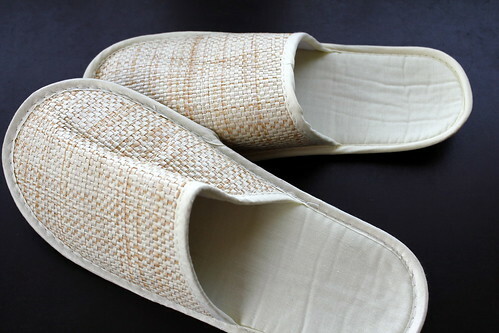 A hotel I stayed in last month provided these fantastic bamboo slippers along with some fine toiletries and a few other goodies. 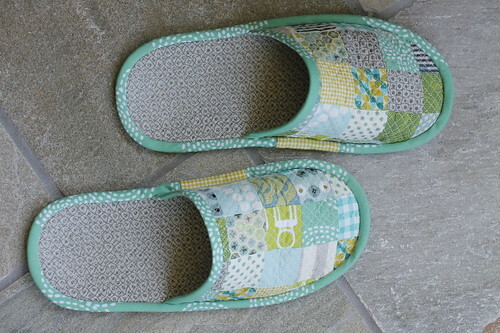 Instantly, I fell in love with the slippers and couldn't wait to return home to dissect them and make a pattern. I got to work immediately and in short order, I had my own pair of cozy, custom slippers, plus, a pattern to use whenever I need a fresh new pair. 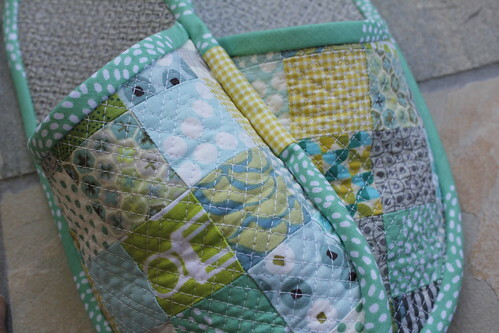 I did some small patchwork and some relatively extensive quilting on these, both a bit time consuming. I think I'll scale back a bit on the detail in the future and be more conservative with my time. It took two days for me to pull these together; I estimate about 12 hours of work all together. A bit much for such a small yield. Ages ago, I bought this rubberized material at a fabric store, with the intention of one day using it for slipper soles. It worked beautifully and keeps me feeling secure when walking up and down my hardwood stairs. Just like when I cook, when I make patchwork, I always make a little extra as I love to have left overs. 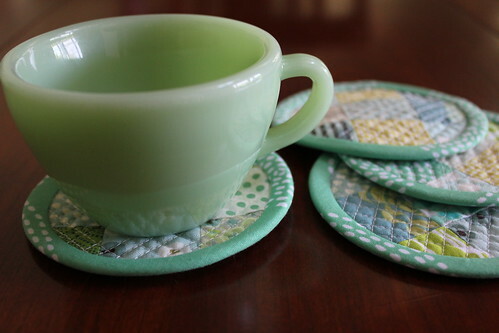 I had enough to make several coasters that I think are just right for my Fire King Jadite coffee cups. 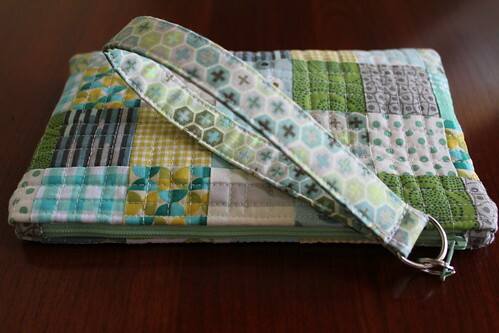 I liked this combination of fabrics so much, I made a little more patchwork, just enough to make this summer wristlet. 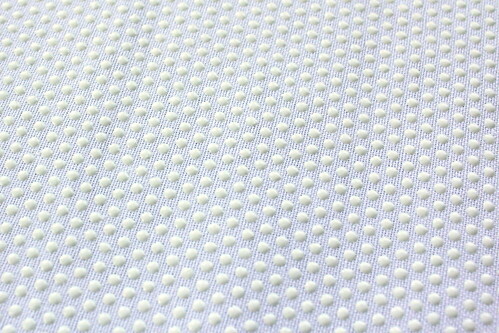 I added an inch to both the length and width of my Oh Fransson pattern to give me additional room to include my sun glasses. Fortunately, there is quite a bit of sun today. I might just have to go out with my new bag. Too bad a can't wear my matching slippers as well! Fabulous projects! Those slippers really look professional...I think they look like a million bucks. And the bonus projects...sigh...perfection! Love your projects! I'm not sure which is my favorite! They all look great! I wish I could get inspired like that! so Happy to win the wrislet..........thank you Barbara so much.. The wristlet is so pretty! I love how you put fabics together! !